Own Bob The Builder - Adventures In Bobland Bay DVD from Deff, DVD, Blu-Ray & 4K Video Specialists - Free UK Delivery..
Own Bob The Builder - Bobs Big Plan DVD from Deff, DVD, Blu-Ray & 4K Video Specialists - Free UK Delivery..
Bob the Builder and the team have a "Totally Extreme" time at the Winter in Spring Festival! "Team Bob" are building a chairlift to take snowboarders to the top of the hill. While Bob reluctantly has a snowboarding lesson, Scoop can't resist a snowy slide but causes an accident leaving the first chairlift passengers dangling from the cable! Can Bob use his new snowboarding skills to ski to their rescue? 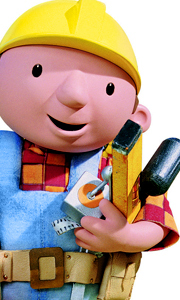 Meanwhile, the team go hi-tech fo..
Bob the Builder and his team are ready to build big! Bob is on hand to rescue his friends when Scoop is stranded sky-high and Leo gets trapped in Fixham castle. We meet the Spring City Rockets at an outdoor movie space and Scoop mixes a crazy concrete creation inspired by Chef Tattie's milkshakes. No job is too big for this team as they build it Sky-High! 6 Fun Filled Episodes! Sky-High Scoop, Rockets under the Stars, Scoop's Big Break,..
Own Bob The Builder - Built To Be Wild DVD from Deff, DVD, Blu-Ray & 4K Video Specialists - Free UK Delivery..
Own Bob The Builder - Can Do Crew DVD from Deff, DVD, Blu-Ray & 4K Video Specialists - Free UK Delivery..
Own Bob The Builder - Can Do Pack - Can Do Crew / Starting From Scratch / Super Scambler DVD from Deff, DVD, Blu-Ray & 4K Video Specialists - Free UK Delivery..
Own Bob The Builder - Can We Fix It - Yes We Can DVD from Deff, DVD, Blu-Ray & 4K Video Specialists - Free UK Delivery..
Own Bob The Builder - Dig This DVD from Deff, DVD, Blu-Ray & 4K Video Specialists - Free UK Delivery..
Own Bob The Builder - Here To Help / Seaside Adventures / Can We Fix It DVD from Deff, DVD, Blu-Ray & 4K Video Specialists - Free UK Delivery..
Own Bob The Builder - Here To Help DVD from Deff, DVD, Blu-Ray & 4K Video Specialists - Free UK Delivery..
Own Bob The Builder - Knights Of Can-A-Lot DVD from Deff, DVD, Blu-Ray & 4K Video Specialists - Free UK Delivery..
Own Bob The Builder - Lets Scram DVD from Deff, DVD, Blu-Ray & 4K Video Specialists - Free UK Delivery..
Own Bob The Builder - Lofty Lets Loose DVD from Deff, DVD, Blu-Ray & 4K Video Specialists - Free UK Delivery..
Own Bob The Builder - Mega Machines DVD from Deff, DVD, Blu-Ray & 4K Video Specialists - Free UK Delivery..
Own Bob The Builder - Race To The Finish DVD from Deff, DVD, Blu-Ray & 4K Video Specialists - Free UK Delivery..
Own Bob The Builder - Radio Bob DVD from Deff, DVD, Blu-Ray & 4K Video Specialists - Free UK Delivery.. When a sudden snow storm hits Sunflower Valley, it's up to Scrambler The Off Roader and Zoomer The Skidoo to lead a spectacular all-action rescue mission. They must save their friends from the mountains in time for Bob's big winter party. But disaster strikes when Scrambler lets the mission go to his head and it looks like the party is doomed! Will Scrambler and Zoomer learn to work together? Will Bob's Mum and Dad make it to the party?.. Own Bob The Builder - Seaside Adventures DVD from Deff, DVD, Blu-Ray & 4K Video Specialists - Free UK Delivery..
Snowed Under: Bob the Builder and his team of machines travel to the Winter Games in snowy Bobblesberg. Their job is to build a log cabin for the Bobsville Mayoress but a huge snow storm hits and leaves the event building machines stranded en route. There' is so much to do and the clock is ticking: can they build it? Built To Be Wild: Yeehaa! Bob and the team travel to Cactus Creek for a Rootin' Tootin' cowboy holiday with their host Ri..
Own Bob The Builder - Speedy Skip DVD from Deff, DVD, Blu-Ray & 4K Video Specialists - Free UK Delivery..
Bob the Builder and his Can-Do Crew have fun getting it done in these exciting building adventures! Join them as they construct a new football stadium and learn why working together is always the blueprint for success. Scratch, the newest member of the team, has many lessons to learn, such as the importance of taking naps and following directions. But he is not alone - Roley, Dizzy, Scoop and the entire Machine Team are ready to share i..
Own Bob The Builder - Super Speedy Benny DVD from Deff, DVD, Blu-Ray & 4K Video Specialists - Free UK Delivery..
Own Bob The Builder - Team Bob To The Rescue 3 DVD from Deff, DVD, Blu-Ray & 4K Video Specialists - Free UK Delivery..
Own Bob The Builder - The Best Of Bob - 10th Anniversary DVD from Deff, DVD, Blu-Ray & 4K Video Specialists - Free UK Delivery..
Own Bob The Builder - The Big Dino Dig DVD from Deff, DVD, Blu-Ray & 4K Video Specialists - Free UK Delivery..
Own Bob The Builder - The Legend Of The Golden Hammer DVD from Deff, DVD, Blu-Ray & 4K Video Specialists - Free UK Delivery..
Own Bob The Builder - The Three Musketrucks & Other Stories DVD from Deff, DVD, Blu-Ray & 4K Video Specialists - Free UK Delivery..
Own Bob The Builder Series 3 to 4 DVD from Deff, DVD, Blu-Ray & 4K Video Specialists - Free UK Delivery..